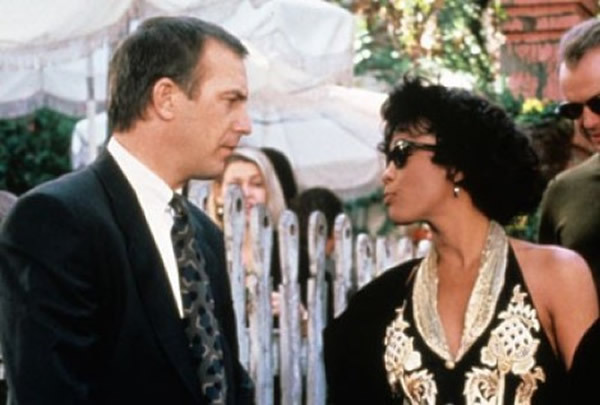 Whitney Houston movies: The Bodyguard with Kevin Costner. Singer Whitney Houston was found dead at the Beverly Hilton Hotel in Beverly Hills earlier today. She was 48. For the time being the cause of death is unknown. Though best remembered for hit songs such as “Where Do Broken Hearts Go” and “I Wanna Dance With Somebody,” in the 1990s Houston also appeared in a handful of movies. Her most notable film role by far was in Mick Jackson's The Bodyguard (1992), an unabashedly romantic tale (written by Lawrence Kasdan) co-starring Kevin Costner, then at his peak as a box office star. Much ado was made at the time because the interethnic romance between Costner (as the bodyguard, a role originally written for Steve McQueen in the '70s) and Houston (as a singer threatened by a stalker, a role originally written for Diana Ross) was never consummated on screen, and even more ado was made about The Bodyguard's lack of a coherent plot and characters. In The Washington Post, Rita Kempley complained that “Costner, who was probably more alive as the corpse in The Big Chill than he is here, learned about the script when he and Kasdan were making Silverado, … Houston, who is doing nothing more than playing Houston, comes out largely unscathed if that is possible in so cockamamie an undertaking.” Audiences didn't seem to mind, as The Bodyguard went on to become one of the year's biggest box office hits, grossing $410 million worldwide. Forest Whitaker's Waiting to Exhale (1995), though still a solid hit in the United States, was much less commercially successful than The Bodyguard. Houston was one of four women – Angela Bassett, Lela Rochon, and Loretta Devine were the other three – dealing with man trouble. Despite the fact that Houston was the biggest name, the fluffy, soundtrack-propelled Waiting to Exhale belonged to Bassett, who easily dominated every one of her scenes. Clearly targeting black moviegoers in the U.S., Waiting to Exhale earned $67 million (approx. $122 million today) in North America, but only a paltry $14.4 million abroad. Penny Marshall's unenthusiastically received The Preacher's Wife (1996), for which Houston earned a reported $10 million, was a moderate hit domestically. (The San Francisco Chronicle's Peter Stack enjoyed it, especially Houston, “[who] is rather angelic herself, displaying a divine talent for being virtuous and flirtatious at the same time.”) A remake of Henry Koster's highly popular Oscar-nominated fantasy-comedy The Bishop's Wife (1947), The Preacher's Wife had Houston, Denzel Washington, and Courtney B. Vance replacing Loretta Young, Cary Grant, and David Niven. Domestic box office grosses totaled $48 million (approx. $87 million today). Houston's film career ended abruptly at that point. Following a sixteen-year hiatus, she will be seen again on the big screen later this year in Salim Akil's Sparkle, about a trio of singing sisters who face drug- and fame-related problems. Houston, who battled drug addiction for years, is featured alongside Mike Epps, Derek Luke, Omari Hardwick, Carmen Ejogo, Tika Sumpter, and Jordin Sparks. Sparkle is scheduled to open in August. Houston was married to rapper Bobby Brown from 1992 to 2007. According to reports, there's a Whitney Houston tribute in the works for the Grammy 2012 ceremony tomorrow. Whitney Houston was clearly one of the very best of the best, which unfortunately today also is strongly correlated with substance and alcohol abuse. I grieve her death especially because at this late stage of her addiction[s] surely she had to realize that she would never again ever, ever recapture that first freebase or crack high hit ever again. At this point she surely knew that one is too many and a thousand are never enough. And even though in N.A. relapse is far more often a part of recovery than in our sister program of A.A., we will all miss her TERRIBLY !!! All the way home !! !